Elkagorasa the Casual: Hearthstone Beta key arrives. Friday, I got a beta key in my mail. (nope, I don't have any to give away) Loaded up the game and then played the game while working that night. Never one to play Magic, the Gathering or invest in the TCG, I found this game actually a lot of fun. .
You start the game with a basic "starter" deck. 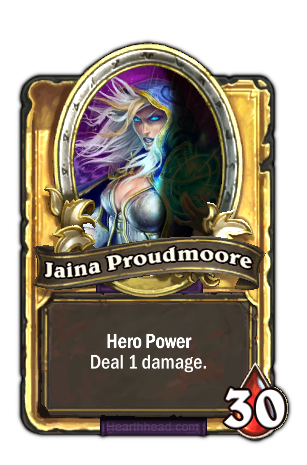 Mine was based on the Hero, Jaina Proudmore. The goal of the game is destroy all the 'health' of your opponent's hero. As a mage, you get a few spells, and a few minions that you can call to fight for you. As a hero she a special power that she can cast Fireblast (which if targetted wrong, can be aimed at yourself!!!). The game is part resource management, part strategy. You start a round with 1 mana. Each card has a mana cost, ranging from 0 to ?? (seen 10 so far). Each turn you get one more mana crystal. Cards that you can play include minions or various class type abilities (i.e. attacks or spells). Minions range across all the npcs from the Warcraft universe. Each minion has an attack damage level and health. 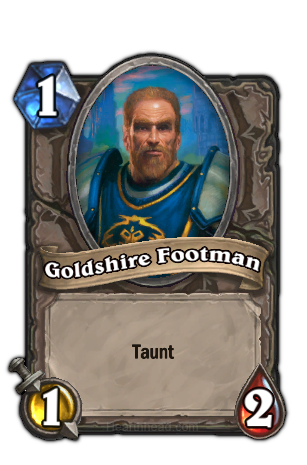 A number of the minion cards have a special ability, for example the footman has a 'taunt' meaning it acts as a tank and must be attacked first, before the Hero. For abilities, the mage can cast a 6 damage fireball, 1 damage aoe damage arcane explosion, or even polymorph. Three types of play. First off you can Practice against the AI. Your existing deck against another hero. As you beat a hero, you get their basic (10 card) deck. Beat all 10 Heroes, you open up "The Arena" (more later). This is a fun way to explore each of the various classes. Priest has a lot of heals. Paladin nice balance of heals, dps and the hero can even attack with weapon. Hunter has abilities that charm beasts, causing better minion attacks. Warlock as an interesting mix of healing, dps and minions. (Yes, Hellfire hurts ALL players! Good way to kill your own minions off.). Each fight earns you a bit of XP. Enough XP, you level up. As you level up, you earn new cards (abilities). IIRC, I got a new ability each each even level until 10. Now I have to get to 20 before I see my next one. Next is Play. You play against a random "worthy opponent" aka human. One added element of Play mode is that it appears to include the option of quests. The quests I had so far include "kill 40 minions" and "do 100 damage to opponent". Once you complete the quests, you can get random rewards like gold, pots (not sure of what) and packs of cards. Last is the Arena. The arena is slightly different than standard Play mode in that you pick your deck of cards. I went through picking the "best of" until I had 30 different cards. Using this 'stacked' deck, you play against another three humans, maybe more if you win (I haven't won any yet). This is one of the aspects that Blizzard has implemented their real-world money charges into. You can spend 150 gold (earned from quests earlier) or you can spend $2( or was it $3?) to enter the arena. Of course, "the first time is free!" The other way to spend real-world money to buy card packs. Prices included one-to-multiple decks at a single time. Updated: Prices are about $1.50 each. Here's a fairly high-level sample of game play. Both players have a number of cards beyond the basic deck. Note the gem in the middle of some of the cards (56seconds) shows white and blue (common and rare), are not typically with basic set, possibly even an arena game based on the golden token spun to determine who goes first. hey man congratz on the key. would you happen to have an extra one? Nope, only got the one from Blizzard. Let you know if more happen to come my way.. If you do get any more, please give send me one. I'm slowly dying of jealousy and boredom. I NEED A KEY! My suggestion to everyone wanting a key; start a blog. Since I've started this blog (and signed up for the betas), I've participated in every beta and usually early on. I am sure Blizzard loves the free coverage of their games. I only have one account and don't have any extra keys.